Now in his sixth season, the 2018 Rhinos Player of the Year was awarded a new contract that will keep him at Emerald Headingley until at least the end of the 2020 season. 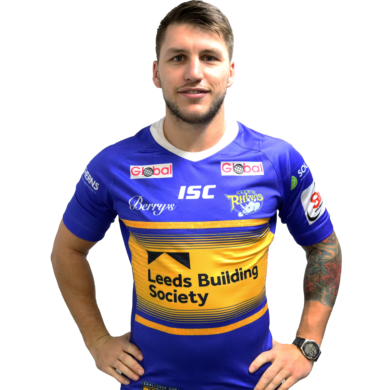 Leeds Rhinos beat competition from Super League and the NRL to secure the signature of England winger Tom Briscoe on a five-year contract from Hull FC ahead of the 2014 season. He made an instant impact at the Rhinos, scoring a hat trick on his debut against Hull KR and went on to register a try in the triumphant Challenge Cup Final win against Castleford. A year later he was once again the star at the national stadium, crossing for a record breaking five tries against Hull KR to help his side retain the famous trophy and earned the Lance Todd Trophy for his sensational performance. A shoulder and ankle injury kept him sidelined for part of the 2016 season, but he returned during the latter stages of the campaign to help the team secure their place in Super League with seven tries in the Qualifiers. In the 2017 he was an almost ever present in the side and helped the Rhinos to their eighth Super League title with two tries in the Grand Final against Castleford Tigers. Before joining Leeds he came through the Hull youth system as a centre but emerged to play on the wing and a year after making his debut he was called up to the England squad for the International game against Wales, aged just 19. In 2010 he finished as Hull’s top try scorer with 16 and made the most clean breaks. He helped Hull to a Play Off finish in 2011 as joint top try scorer and best metre maker and was a try scorer in their Play Off Elimination loss to Leeds and was named in the Super League Dream Team. In 2012 he had his best attacking season for Hull, scoring 29 tries including three in their Play Off campaign. He played in two Challenge Cup Finals with Hull but lost to St Helens in 2008 and Wigan in 2013. He made 148 appearances for Hull FC and scored 90 tries after breaking onto the Super League scene in 2008, making his debut against Warrington and going on to appear in the Challenge Cup Final. Prior to the 2013 World Cup, Tom had made 12 appearances for England and won seven of those fixtures and registered eight tries and one goal. He was named in Steve McNamara’s squad for that year’s Rugby League World Cup and claimed two tries against Ireland and one against Fiji in the group stages.